Fr. Anthony spends time with St. Joseph’s students. High School, and they are still in session. When classes let out on Friday and spring break officially kicked off, I rode along to the Pine Ridge area in southwestern South Dakota to take some of the Lakota students home. We try to send two staff members in each van or mini bus, and it was very helpful to have an extra staff person this time! One of the student’s relatives was late getting to the pick-up spot in Martin, South Dakota. I was able to wait with her while the others continued on to Pine Ridge. As we drove back through the Rosebud Indian Reservation, it was nice to see some of the towns our students come from. Three of our high school girls recently made a trip to the University of Minnesota in Morris (UM-M). Ashley is already accepted to the college and will take pre-veterinary classes; Amber and Michelle went along to support Ashley and check out the campus. The nice thing about UM-M is that, once a Native American student is accepted, tuition is paid in full. Of course, some expenses still remain, like books, room and board and incidentals, but tuition is a huge help. Pam, who chaperoned the trip, works with the juniors and seniors to help them find college programs they might consider entering. She makes several of these trips with our students at this time of year. We are disappointed to report the Chamberlain Cubs’ basketball season is over. The Lady Cubs went up against the team from Winner last week … the team lived up to their town’s name and defeated the Lady Cubs to knock them out of further contention. On Monday night, the boys took on Cheyenne-Eagle Butte to see who would be punching their ticket to the Boys’ State Basketball Championship. Chamberlain held its own until the third quarter and then ran into trouble with turnovers, fouls and poor shooting. The Cheyenne-Eagle Butte Braves were able to win the game at the free throw line and will move on to Sioux Falls for the State A tournament. Though we’ll be losing some good senior players, we are excited about next year. Those lost will be replaced by Junior Varsity players, and the Cubs’ JV squad has not lost a game in two years! On Monday, I attended the Board Meeting at Cheyenne River Indian Outreach (CRIO) in Eagle Butte, South Dakota. St. Joseph’s and CRIO are both operated by the Priests of the Sacred Heart and work together in a variety of ways. CRIO operates a shelter on the Cheyenne River Indian Reservation for those suffering from domestic violence (the only one of its kind for 100 miles in any direction), a thrift store and a residence for at-risk youth ages 10-17. Just a few days ago, St. Joseph’s received a call for help from CRIO – their thrift store shelves were nearly bare. They would soon be unable to help meet the needs of the community in terms of clothing and household items. Thanks to you, St. Joseph’s was able to send a load of clothing and other needed items to help re-stock the shelves. Your faithful support makes a real difference to so many people in need. Pilamaya – thank you! May God continue to bless and help you have a reflective and beneficial Lent. You are remembered in our prayers. such wonderful happenings… good luck and God bless you all ! I am a veterinarian, and I want to wish Ashley the best of luck as she pursues her dream! I would be happy to offer any help or advice she may want (or any other student interested in veterinary medicine). Thank you Dianna – that’s very generous of you to offer your expertise! I thank you for the beautiful gift package. May the Good Lord Bless you all. 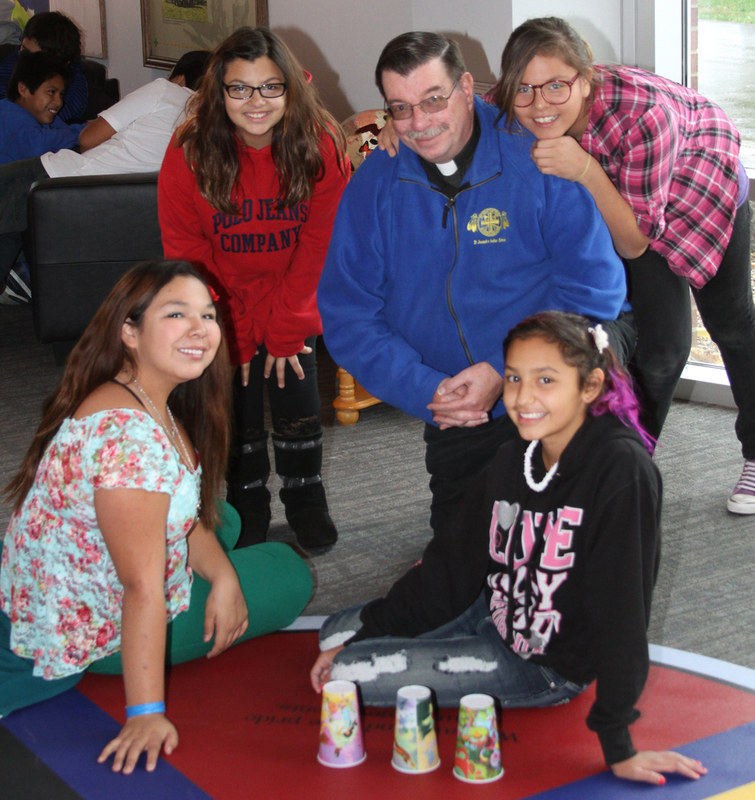 Next Next post: Congratulations are in order – St. Joseph’s Lakota girls meet their goal!